If you’re wondering what to use, this isn’t the article for you. If you’re wondering why to use – and perhaps how to use – read on. The sentences above might be a little uncomfortable to read. Though we understand that social media is addictive, discussing it in terms of ‘use’ implies something darker and could be considered pejorative. The addicted are incensed. The Luddites nod their heads righteously. And yet, the verbiage is apt. I, like many, continue to examine and balance my own use of this 21st century tool – caught (again like many) between necessity and frivolity; work and play. I am a gardener and a writer. My life is a mixture of the physical and the visual. Though I see social media as a valuable tool as it relates to that life, the trick is not losing the life in the use of the tool. Simply put, the more time one spends online, the less time one spends onlife. Social media has the power to make these days very trying. 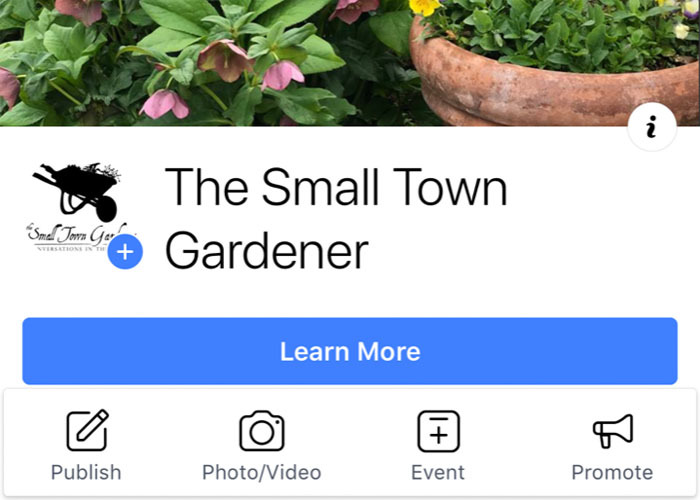 Although Instagram & Facebook give me a glimpse into the lives and gardens of fellow garden writers back in California and the UK – they also give me a glimpse into the lives and gardens of fellow garden writers back in California and the UK. I’m sure you see the issue here. Throw in a few friends flagrantly drinking superior prosecco on the back of a pickup truck (California is a hotbed of mixed stereotypes) while the wildflower superbloom supers all around them, and one is forced to supersprint to the fridge for a half a bottle of inferior Viognier. About the only superbloom going on around here is five vases of indoor forced tulips on my kitchen counter. And though I tried to set up a superbloom shot about a glass and a half into the Viognier, it ultimately lost something in the translation and I abandoned the effort. We are in the In-Between Time – a limbo between seasons where there is color, but there is also disarray, and one must be in the right frame of mind to studiously look past the disarray and enjoy the color. Depending on our location, sun exposure and micro-climates, we may even find ourselves behind the gardens of others in our own neighborhoods. The edgeworthia is spectacular this year – And I must look past the browns and greys to appreciate it. For instance, here at Oldmeadow, the hellebores are finally flowering, but they are surrounded by the detritus of winter – leaves, sticks, browned weeds and the odd broken plant label. (I really must speak to the staff.) 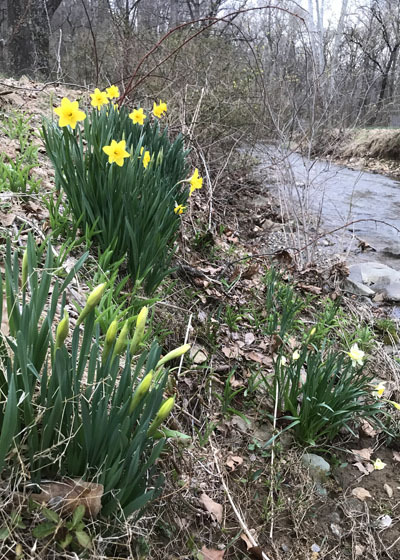 Tufts of stream-sown daffodils are up and blooming along the banks of the creek, but they need a makeup lady to remove the browning thatch and sycamore leaves that can hide those cheery faces. 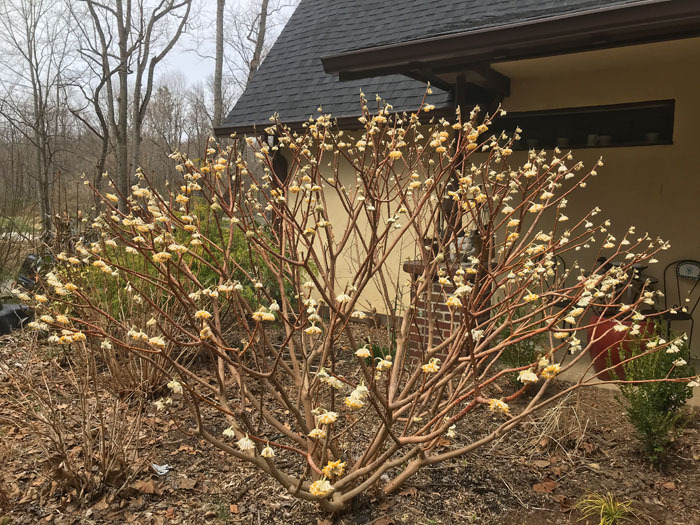 And though the edgeworthia is doing a fabulous job of perfuming the walkway up to the front door, that walkway is populated by spider-webbed boots, hastily thrown hand tools, and last year’s decorating efforts. Though others in warmer climes are frolicking and can’t wait to tweet it out, our landscape is awakening, and such things take time. I cannot have Bradley Cooper first thing in the morning. Instead I must settle for the occasional brilliance of George Costanza over coffee, and wait patiently for the delights of the afternoon. And perhaps avoid watching the Oscars until May. Once upon a time, when other people’s gardens and lives consisted of coffee table books, magazine covers and exotic postcards from frenemies, such garden comparisons were fine and bearable – even instructive. Even better the prose without photos which engaged the mind to sketch one’s own thoughts onto the canvas of one’s own garden. Though I yearned for the awakening, I knew that my garden would soon experience its own change in season, and I was more attentive in recognizing each stage for the miracle it was relative to the one directly before. I fell deeper in love with my garden as a result. I knew that in California my sister was picking the last of her lemons and watching the honeybees on spring-flowered rosemary in early March; and I also knew that Kew Gardens was covered in tulips by early April; but such thoughts were illusory. My garden was in front of me. I couldn’t see my sister at this minute picking her lemons and rosemary for a pork tenderloin while I tried to figure out how to grasp bittercress rosettes and keep my fingertips from freezing. The staff at Kew wasn’t at this minute rubbing my face in hundreds of ‘Flaming Purissima’ tulips underplanted with healthy and happy primulas. And the California superbloom was something I remembered and treasured certainly, but also something that I read about and compartmentalized. No envy. Just admiration. I knew that soon enough, our season would come. I still know this. But just as the sight of a juicy burger between sitcoms can unsettle the weakened vegetarian and send the dieting carnivore out for a late night snack; if I am not very careful, the glory of those tulips and the sight of that superbloom in someone else’s garden right now can make me hold my awakening garden in contempt. And I’ve got a lot of ways to see those immediate images if I choose. 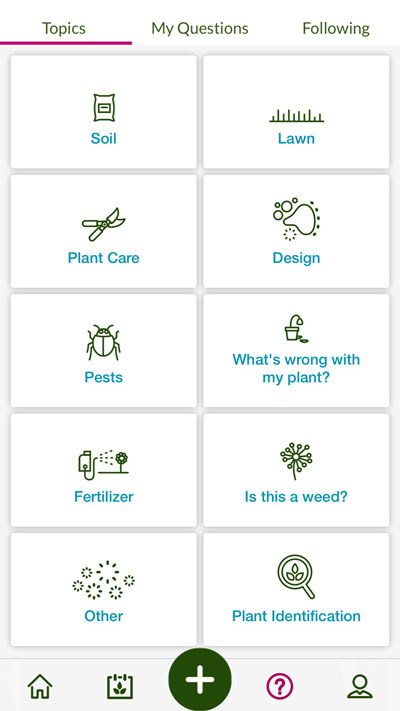 Twitter, Instagram, Facebook, Pinterest, SnapChat, LinkedIn, Youtube, Tumblr, Reddit – there is even a platform for gardeners – GrowIt! Yes it is a double edged sword. Many of us are trying to learn and to grow; and some of us just want to learn to grow. Social media provides this and more. I am made aware of new plants, forgotten plants and plants I might wish to avoid. GrowIt! 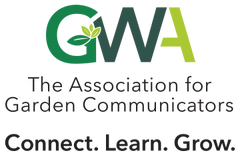 is a social media app specifically for gardeners. I am exposed to trends in current design. I can get regional advice and plant suggestions. 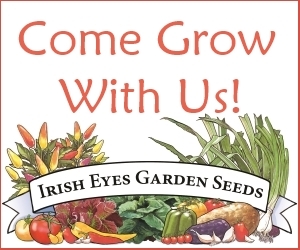 I can see gardens that I may never see in person, through the eyes of gardeners I trust. I can preview good tools or equipment that might make my job easier. I can tour gardens I’m thinking of visiting. I can intimately learn about a specific garden. How I process that information has everything to do with my own state of mind when I pull out that phone and start to scroll. So I follow a few rules to keep myself learning – not yearning. Do a spring cleaning of your social media feeds to delete or unfollow the ones that irritate or annoy you, or those that are not giving you valuable information. Think of it as a reference book tailored specifically to your hobbies and interests. Take a realistic and more intimate approach to your feeds. It is simply not possible to follow 3,586 people and get more than a superficial glance (if any) at the timeline in their lives and gardens. Respect the value of your own viewing time and save it for a few, relevant feeds. If you are following simply to be followed – you are building a straw house. 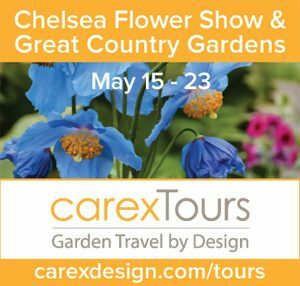 Seek out the voices you already love; the garden designers that fascinate you; the gardens you hope to visit someday; the places in the world that excite you. Give yourself a specific time to look at your feed, much as you give yourself a specific time to read a book or online article. Don’t touch it otherwise. Avoid the immediacy of social media when you are feeling low and vulnerable – particularly during the In-Between Time, After-A-Pizza Time and I-Guess-We-Can’t-Afford-A-Vacation-This-Year Time. Ask yourself why you are using a particular platform, and if there is no value, delete your account. For instance, I don’t actively use Twitter as I see it as a study in 3V: Viciousness, Virtue Signaling and Vulgarity. Honestly assess whether or not you are spending more time looking at something (like gardening, cooking, DIY projects, etc.) than actually doing it. Reverse that. Above all, start the morning without those feeds. Wake up to your own life, your own family, and your own garden, and enjoy them on their own merits. 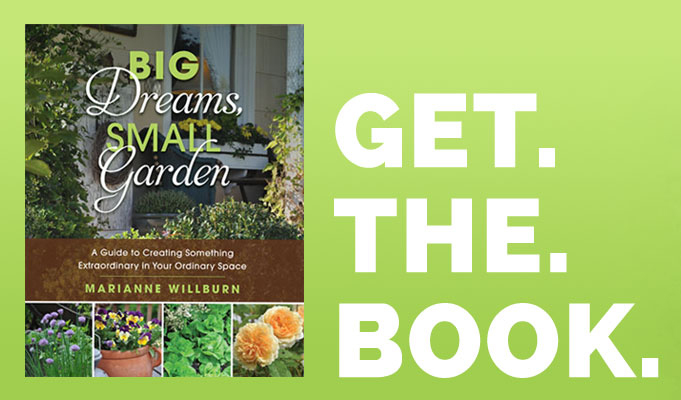 Don’t let the pursuit of the virtual garden stop you from creating one here on Earth. A version of this article was originally published in The Frederick News Post and is republished here with kind permission.